In a meeting with the Turkish Ambassador to Norway, Esat Safak Göktürk, on 5 September, Norwegian PEN asked for the immediate release of the five imprisoned journalists and members of the newspaper Cumhuriyet: Ahmet Sik, Akin Atalay, Empre Iper, Kadri Gürsel and Murat Sabuncu. 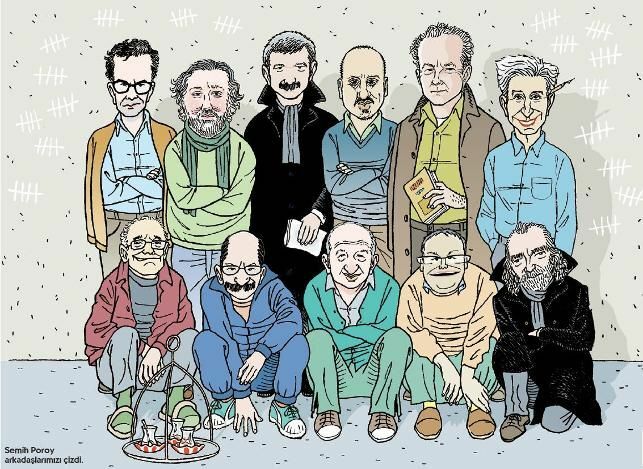 An illustration by cartoonist Semih Poroy depicts 11 journalists and executives from Cumhuriyet who were on trial on July 24, 2017 in Istanbul. Norwegian PEN has been monitoring the case against Cumhuriyet closely and conclude that there is nothing in the indictment that refers to any form of criminal activity. The trials that began on July 24, 2017 focused solely on journalistic activities. Questions by both the judges and the prosecutor were exclusively about the news and the editorial policy of Cumhuriyet. They asked questions concerning the motives behind certain top stories and about the wording in the headlines. The independent editorial policy was questioned; press freedom and the right to receive free news was put on trial. During the pre-trial detention period, the imprisoned journalists were kept in isolation and could only see their lawyers and families for one hour a week. Their communication rights, which were critical for preparing legal defences, were limited. Their fundamental rights of freedom and security, freedom of expression and the right to a fair trial were violated while the basic principle of innocence was abused. We are deeply concerned for the situation of freedom of expression and freedom of press in Turkey, where more than 170 writers and journalists now are in prison. Freeing the 5 imprisoned journalists form Cumhuriyet will be one step in the right direction.